Shock Doctor's Core Compression Short is constructed with moisture wicking four-way stretch fabric that moves with your body while eliminating sweat. The mesh cup pocket secures the cup and increases ventilation to improve cooling. The comfort waistband allows you to play without irritation. 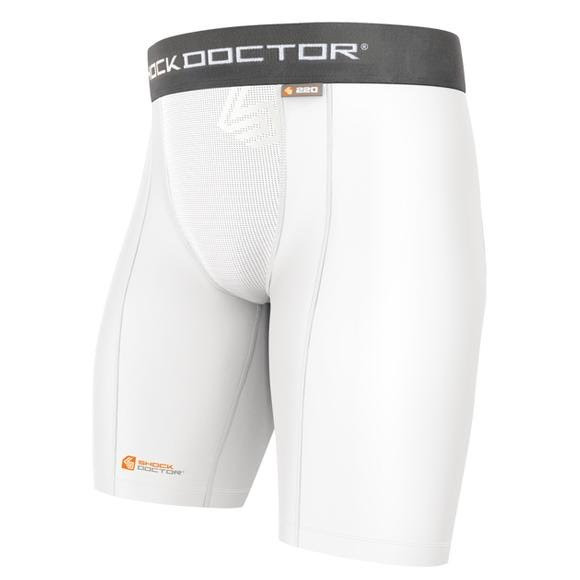 Shock Doctor&apos;s Core Compression Short is constructed with moisture wicking four-way stretch fabric that moves with your body while eliminating sweat. The mesh cup pocket secures the cup and increases ventilation to improve cooling. The comfort waistband allows you to play without irritation. Their exclusive X-Pocket Cup Retention System is designed to position the cup pocket in a more natural position between the legs for a closer, more comfortable fit.